Kootenay Tonewood is owned and operated by Graham Hein, a British Columbia native with an extensive background in forestry. Graham walks the woods in the Kootenays to find the towering Engelmann spruce, Western Red Cedar and Tamarack trees which he will selectively harvest to produce sound boards for musical instruments. He practices forest stewardship by using only trees which have reached and surpassed their maturity. Graham started sawmilling at age 18 and in time learned to sort various species of trees into lumber grades. He became a skilled sawyer with a respect for the grain and beauty of wood. Eventually he learned the entire spectrum of the business and developed key contacts in the lumber industry. 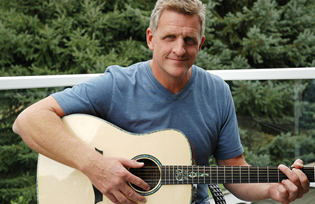 He worked as production manager at a sawmill that produces specialty lumber and it was here that he first learned about music wood—which must both look beautiful and produce a musical tone. Graham began experimenting in his backyard garage and devised a specialized method of cutting spruce into tonewood. Soon his products were in such demand worldwide that he left his job to devote all his time to crafting high-quality sound boards by hand. In 2006 he produced 15,000 matched sets of music wood. This year he will make 50,000. There is quite a journey involved in taking a standing tree and turning it into an exquisitely crafted sound board. The science of wood involves specialized knowledge about the elasticity and other important qualities of individual trees. 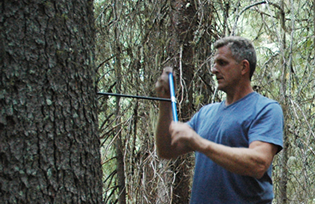 Graham Hein’s years of experience in the lumber industry combined with his training have made him uniquely qualified to choose the trees which make the best music wood. Once a tree has been chosen, most often a stately Engelmann spruce, selective logging is used to harvest it and it is then transported to the yard at Kootenay Tonewood. Only about one in a thousand trees has the correct music wood properties. Graham hand-splits the log and uses specialized equipment to mill it. It then dries two kilns he has designed and built and which features careful climate control. 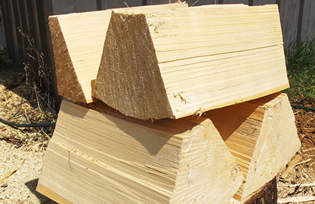 This process produces tonewood of the highest quality, which is then hand-sorted by grade.